I am not a brilliant cook. God knows, I’ve been behind many a disaster in the kitchen. Truth be told, I don’t enjoy cooking on a regular basis but I love food and everything about it. Be it the spices, the aroma, the texture, the science behind a recipe, its sophisticated technique, so on and so forth. Nothing excites me more than a beautiful spread of carefully laid out dishes. So I decided to kick start this new project in which I will try out a new recipe, from different corners of the country and globe. The rule is to cook something interesting, something I’ve never cooked before. I begin with Tibetan momos. These are steamed dumplings stuffed with meat or vegetables. First I prepared dough out of white flour (maida) and lukewarm water, some cooking oil and pinch of salt. For the filling, I grated onions, cabbage and carrot. Cooked a bowl of vermicelli and set it aside. Then I heated some oil in the pan and added a tablespoon of soy sauce, sesame seeds, ginger-garlic paste and paprika. Stir and then toss in all the veggies and noodles. Once it’s cooked, keep it aside. Back to the dough, roll small balls of the same into tiny discs and add tiny bits of the mixture and fold it up in an imperfect circular figure. Steam it for 10 minutes. Voila. My first batch wasn’t all that good. The second one turned out okay. This was a bit tough recipe but I’m glad I tried. The outcome was edible if not elegant. 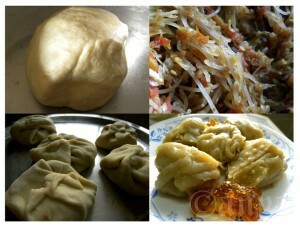 This entry was posted in Uncategorized and tagged food, momo, photography, project 2011, recipes. Bookmark the permalink.